The yellowfin tuna are breed of tuna found in warm seas and oceans around the world as they prefer tropical temperatures. Yellowfin are often refered to as ahi by Hawaiians, which basically means a bigeye tuna. Meanwhile, French and Portuguese Fishermen sometimes refer to the yellowfin tuna as albacora. During the daytime, yellowfin tuna prefer to dive deeper into the water and at night time they change to swim at at shallow depth. This could be in response to the movement of its victims in the deep scattering layer. Even though yellowfin tuna are mainly found in deep sea oceans, yellowfin tuna may approach the shore when suitable conditions exist. Normally, yellowfin tuna feed on baitfish around the volcanic islands of the Atlantic Ocean, Indian Ocean, Caribbean and Western Pacific Ocean, and islands around the Hawaiian archipelago. The reason that the yellowfin ventures inshore is because of the the clarity and temperature of the water is more suitable and more food is available in that area. Yellowfin tuna are just like any other tuna that are warm-blooded as they can heat their bodies up to 43°F warmer than the sea water. This actually helps their muscles to work faster and more efficiently. Tuna uses about 5% of their body weight daily and will swim with their mouths open to allow water into their gills, charging their blood-rich muscles with the oxygen. The yellowfin tuna is reported to have sizes in the range as high as 239 centimeters in length and its weight could reach over 300 pounds or 136 kg. This makes them as one of the largest tuna species but when compared to the Atlantic and Pacific bluefin tunas, it is significantly smaller. The Atlantic and Pacific bluefin tunas both weight can reach of over than 1,000 pounds or 454 kg. 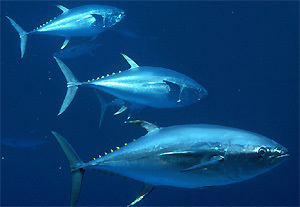 Despite of their heavy weight, yellowfin tuna are built for endurance and speed making them the most powerful swimmers. However for long distance journeys, yellowfin tuna will retract their fins to let the water flow more smoothly over their bodies. 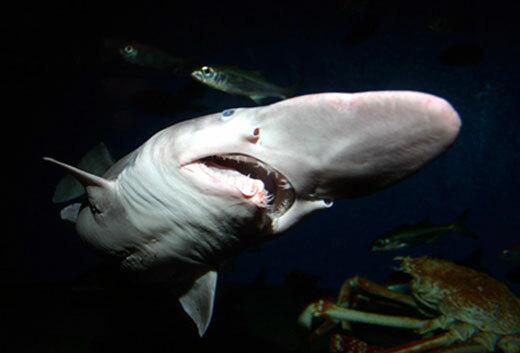 Their bodies are perfectly streamlined, reducing the drag around its fin. This is how they can conserve their energy for long distance journeys. The yellowfin tuna normally target other smaller fish, pelagic crustaceans and squid. Their body shapes are built for speed enabling them to capture fast moving baitfish. The yellowfin tuna frequently prey on lantern fish, anchovies and sardines. 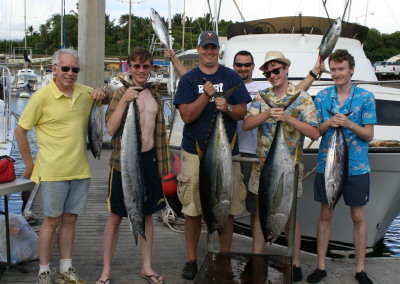 Sometimes the large-sized yellowfin tunas even take on members of the tuna family such as the frigate mackerel and the skipjack tuna. When they are young, yellowfin in turn are preyed by other pelagic hunters like larger tuna, predatory fishes such shark and billfish, and also sometimes by seabirds. However as they increase in size and speed, they are able to elope from most of its hunters. Their predators include the killer whale and the great white shark. However, the main killer of these creatures are by humans through the tuna fishing industry.